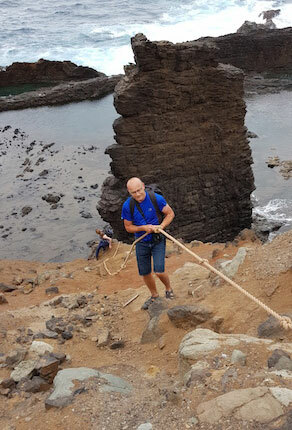 In September 2018, A Rocha UK’s Conservation Director went on sabbatical to South Africa and St Helena. In the enclosed blog, Andy recounts some of the scientific work he undertook whilst on the island. It is 11.30pm on a still and cloudy night and I am standing by an ancient fort on a cliff top on the north coast of St Helena. It would be pitch black were it not for my mercury vapour bulb that is blasting out 500 watts of power to try and lure in some unsuspecting moths. I am feeling a mixture of anxiety and excitement as the first moth flies into the trap. Anxiety, because I am not convinced I will be able to identify what has just flown in, and excitement, as there is a small chance that a new species to science may be discovered. As part of my sabbatical I am undertaking a nightly pilgrimage outside the home of those kind enough to host me on the island. My aim is to record as many moth species as possible and to collect any potential new species for examination in a German university. Moths are a great indicator of the quality of the local environment; and a scarcity of moths can indicate trouble brewing for birds and small mammals that rely heavily on insects like moths for food. My anxiety redoubles, when I am hit on the head by a huge moth-that then scurries behind my spectacles (which are on my face) and starts squeaking like a mouse. Once the initial fear has passed I realise I am now in possession of a species of moth I have always wanted to see. It is an adult deaths-head hawk moth; and yes, the noise they emit is a fear response to being handled. A few photographs later the moth has been released unharmed and flies away into the night. The finding of this moth helps to underline a big problem on the island. This is not a native moth species; it has been introduced. Is it possible that such a large and dominant species could be having an impact on native wildlife? Definitely a topic for a future PhD student. St Helena warrants further scientific scrutiny. I don’t yet know whether any of the species I found will turn out to be new to science; but what I do know is that it is a place where it is still possible to find new species and in a world of rapid change and loss, it is reassuring to know that there are places where new life can still be discovered.